It’s that time of year again!! It’s officially 2019, and with every New Year comes newly formed resolutions that help us strive to be better than we were in our previous year!! If your New Year’s resolutions include getting back to the gym and attempting to live a healthier lifestyle, then learning the proper way to warm-up prior to physical activity will not only help improve your activity level and achieve your resolutions, but will also reduce your risk for injury as you start this year. All of us at Harrison Physical Therapy want to show you how to properly structure a generalized warm-up in order to help achieve your New Year’s goals. This typically includes activities such as light jogging, elliptical training, rowing, static bicycle training etc. for anywhere from 5-10 minutes at a moderate difficultly level. The purpose of this portion of a warm-up is to help increase heart rate, increase blood flow to working muscles, increase musculature temperature, and begin perspiration. These activities help prepare the body to perform movement more efficiently, thus decreasing the risk for sustaining a musculoskeletal injury. This is where an individual will perform stretching activities for the specific muscles that will be used during the activity such as hamstring stretching, calf stretching, gluteal stretching etc. in order to help allow for improved ranges of motion prior to physical activity, and therefore decrease an individual’s risk for injury. Stretching activities are typically performed for 30 seconds and repeated between three to five times for each muscle group. 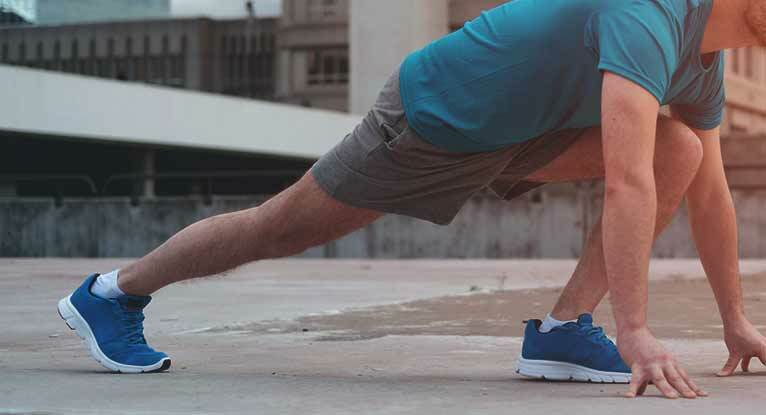 (*Note: For individuals participating in higher level activities or athletic events, dynamic stretching is the preferred method for improving mobility prior to activity, and would be performed at this time. Check out this month’s Exercise of the Month video for more information and examples*). This is where an individual will perform the specific movement they wish to train that day, but at a much lower intensity than during their actual workout. This portion of a warm-up is typically performed directly before the training activity, and the purpose of this is to prepare an individual for the specific activity demands during that workout. The sport or activity specific portion of a warm-up is typically performed for 1-2 sets at low to moderate intensity. For example if an individual is performing a bench press then beginning with 2 sets of 10 repetitions of a lighter load prior to beginning the workout will help prepare their body for the demands specific to that activity, thus decreasing that individual’s risk for injury. It’s also important to note that the benefits of a proper warm-up do not last forever. Typically there is a transition period of five to ten minutes between warm-up activities and workout activities in order for the benefits of a warm-up to be sustained. Waiting longer than ten minutes will allow both your heart rate and the blood flow to working muscles to decrease, thus increasing an individual’s risk for injury when performing new or increased physical activities.